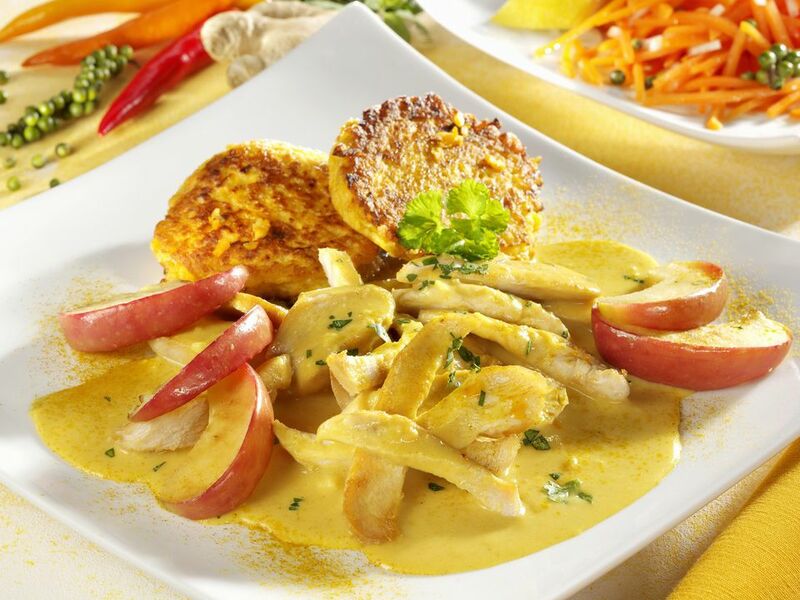 Try this easy and delicious low fat, low sodium recipe for Crockpot Chicken and Apples. The flavor is slightly spicy because of the curry powder. If you're serving this recipe to kids, you can reduce or even omit the curry powder and the recipe will be much milder. The combination of apples, onions, curry powder, and chicken is reminiscent of Chicken Mughlai, but this recipe doesn't contain any milk or cream. It's delicious served over hot cooked rice, couscous, or pasta for a nice winter meal. You can certainly use chicken thighs instead of the breasts in this recipe if you'd like. Use 12 boneless, skinless chicken thighs. The cooking time will be a bit longer, about 6 to 8 hours, since dark meat takes longer to cook than white meat. For a complete dinner, all you need is a crisp green salad, some dinner rolls if you'd like, and a glass of white wine. In a small shallow bowl, combine the apple cider, nutmeg, and curry powder. In a small microwave-safe dish, combine the butter, onions, and garlic. Microwave on high for 1 to 2 minutes or until the onion is softened. Place this mixture in the bottom of a 3 to 4 quart slow cooker. Dip each chicken breast into the juice mixture to coat and then place in the crockpot over the onion mixture. Pour any remaining juice mixture over the chicken. Add salt and pepper to taste. Cover the slow cooker and cook on low for 5 to 6 hours or until the chicken is almost cooked. Add the sliced apples and cook for 40 to 50 minutes longer on low or until the apples are tender and the chicken is thoroughly cooked to 165°F as measured by a reliable meat thermometer. Then mix the vinegar, broth and cornstarch in a small bowl and stir into the liquid in the crockpot. Cover and cook on high heat, stirring occasionally, until sauce is thickened and bubbly, about 10 to 15 minutes. Serve with some hot cooked brown rice. If you have a new hot crockpot, check the chicken after 4 hours on low. If the sauce doesn't get thick enough, just add more cornstarch mixed with chicken broth or apple cider vinegar.